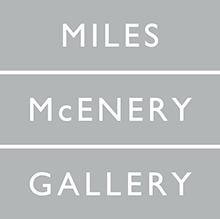 NEW YORK, NEW YORK - AMERINGER | McENERY | YOHE is pleased to announce an exhibition of recent works by Stephen Dean. The exhibition will open 5 June and will remain on view through 1 August 2014. A public reception for the artist will be held on 5 June from 6:00 to 8:00 PM. Stephen Dean is known for his vibrant large-scale celebratory videos, sculptures, and works on paper, which explore the saturdated edge of the color spectrum. Inspired by Francis Picabia's late abstract paintings of circles, Jugglers is a new series of works on paper that engage the motion and instability of color. Made with dichroic glass disks inserted in Kraft paper or aluminum black foil, in configurations of 3s, these works blend geometric sequence adn anthropomorphic qualities, while striking an archaic simplicity. Drawn by its unlikely combination of saturation and transparency, Dean has been working with variously sized dichroic glass for several years. Originally designed by NASA to separate light waves for the visors of its spacesuits and satellite mirrors, dichroic glass was introduced to the art world in the 1970s by Larry Bell and was widely embraced by craft enthusiasts. In Dean's Jugglers, the dynamic contrast of stillness and motion holds our attention. As our brain is hardwired to see faces in almost anything, viewers here are presented with geometric masks. The sheets of paper - punctured with variataions of green, purple or orange glass, reflecting their complementary colors - directly radiate a hypnotic iridesence. Upon closer inspection of any individual disk, the changing hues take on a spatial and temporal dimension of their own, opening a cavity or a window that eventually reveals the wall through its tinted transparency. Color appears as we rarely see it, in its raw state. STEPHEN DEAN was born in 1968 in Paris, France. He has exhibited extensively both nationally and internationally. Exhibitions include “Fútbol: The Beautiful Game,” Los Angeles County Museum of Art, Los Angeles, CA; “Junkies’ Promises,” Paul Kasmin Gallery, New York, NY; “Shock of the News,” National Gallery of Art, Washington, DC; “Les Maitres du Désordres,” Musée du Quai Branly, Paris, France; “Double Down: Two Visions of Las Vegas,” San Francisco Museum of Modern Art; “Mouth Open, Teeth Showing: Major Works from the True Collection," Henry Art Gallery, Seattle, WA; “VOLTA,” Miami Art Museum, Miami, FL; among others. Dean has also participated in numerous biennials, which include the Moscow Biennial, SITE Santa Fe Biennial, 51st Venice Biennale, the Istanbul Biennial, and the Whitney Biennial. Dean’s work may be found in the permanent collections of the Solomon R. Guggenheim Museum, New York, NY; the Whitney Museum of Art, New York, NY; the National Gallery of Art, Washington, DC; Yale University Art Gallery, New Haven, CT; the Fond National d’Art Contemporain, Paris, France; Fondacion la Caixa, Barcelona, Spain; and the Fundacion Jumex, Mexico City, Mexico. Stephen Dean lives and works in Long Island City, NY.